David Graham joins the band for the gig. It’s his last gig with them. 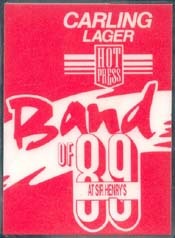 Lawrence remembers: “We played both songs [‘Remembrance Day’ and ‘Ridgeway Street’] at the Carling/Hot Press Band Of ’89 finals in Cork — we had to call David back from University so he could learn the songs and rehearse for the gig”. Before the gig, the band is photographed wearing Carling promo T-shirts. A few minutes before the performance, their drum machine is kicked off stage by a roadie, but is caught in its fall by Neil in the audience. They finish second of the competition which is judged by Hot Press journalist George Byrne and spend the night in the camping before setting off for Enniskillen in the following morning. After the gig, they start looking for a drummer for good.